Kungliga Slottest is the official residence of the Swedish King & Queen. It is a big and very impressive building, with more then 600 rooms. You can visit the palace, but when we were there, it wasn’t open because there were some parties or something going on. A very touristy thing to do, but also a nice thing to see. With music and a lot of big tralala the guards are changing there shifts. 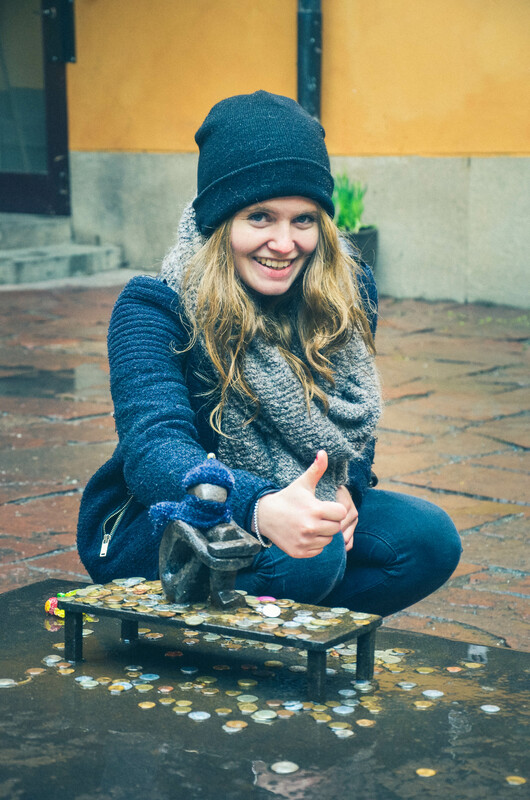 Well, I’m not tall either (only 1m52, LOL), but this statue is really cute and small (15 centimeters). It was originally called the boy that is looking at the moon and is from the artist Liss Eriksson. During the winter the boy gets a scarf and a hat on and during the summer a hat for the sun. People lay down some coins for luck. These buildings are very typical in the Swedish architecture and are so super pretty. Chokladkoppen serves some good food and I recommend to check this one out. It lays on a square where there is always a lot to see or do. Mmmm this one was hard to resist. When you are in Stockholm you need to taste the typical white-red candy (taste like mint), called Polkagrisar. They were made for the first time in 1859 and was originally used as a medicine for colds. At the store you can also see how they are made. P.s. : The store is just so pretty with all those colors!!! Just get lost in the streets of the district of Gamla Stan, because they are super cosy and pretty. Go look for the smallest street in Stockholm. It is only 90 centimeters wide, so you really need to search for it, as it is very easy to walk past it. This is a special place in Stockholm. It is a park located on the top of a hill that originated from the Ice Age. Because of that it was the ideal place to locate the observatory (which is now a museum). You also have amazing views from up there. Ultimate tourist spot but also a unique experience. You can enjoy an ice-cold drink at an ice-table with a nice temperature of -7°C. When you enter you get these warm clothes, some hand gloves and a cocktail of your choice. How cute is this? I feel like this was perfectly custom made for me! If you want to relax a bit and surround yourself with nature, this is a good place to go to. The island is super green and you can walk around here for a few hours and get some coffee along the way. In a very modern building, designed by Gunnar Asplund, you will find the library. As I’m totally not a reader, I never go into a library, but I found this one actually quite beautiful. This is probably the most famous building of Stockholm. You can see the tower from miles away and it is inspired by the Italian Renaissance palaces. It is built around two piazza’s, the ‘Burgerhof’ and the Blue hall. We booked a tour through the city hall with a guide (as it is obligatory), but I can really recommend it. P.s. : At the Blue hall (which is not blue btw) takes the dinner of the Nobel Price place. As it was raining a lot during our trip in Stockholm, we needed to find some activities to escape this bad weather. So we decided to go to the Vasamuseet, which is actually a museum about the war ship ‘Vata’. Apparently this is a top attraction for tourists in Stockholm. This ship was capsized and sunk on its first trip because it was to heavy… If you like to hear some history, this is a nice place to go to. As in every city, I like to walk through the foot halls, like this one in Stockholm. Just look at all this jummie food and taste it yourself. And last but not least…. enjoy the views around the water, because it is just so breathtaking! So this was it… I’m so sad that Gilles has not experienced this trip with me. We weren’t even together back at that time (BUT 5 days later we were together!!!). Now I’ve seen a glimpse of the beauty of Stockholm, I definitely want to go back there in the future (during the summer), because there is so much more to see. Hope you enjoyed reading about my fantastic trip in Stockholm. If you have any questions, please let us know, maybe we can help you! Your coverage of Stockholm in a short time is excellent!!! Thank you so much 😃 I hope it was helpful!